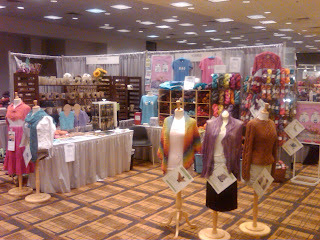 After a days rest from TNNA we got to set up for The Knitters Connection at the convention center in Columbus Ohio. TNNA had been a great place to meet designers and the many shop owners from around the country. We already had a lot of patterns "in the works" with various designers and took this opportunity to encourage a few more, will post their designs as they come. TNNA Columbus 2009 - We have arrived!